Fifty-five years ago this summer, tinsel town invaded Marfa. Editor's note: With the 55th Anniversary of the filming of Giant out in Marfa, we believe it's time to publish this article for all of the folks who ever wondered, "What happened back in the summer of 1955?" On September 30th, the Texas Theater, located at 231 W. Jefferson Boulevard in Dallas, Texas will screen the documentary Return To Giant. It will take place at 7:30 pm with a Q&A session with filmmaker Kirby Warnock and Bob Hinkle to follow. Admission is $8 per person. In the summer of 1955 an army of technicians, cameraman and workers descended upon Marfa, Texas. They would build a huge mansion on the plains that was really just a false front; a house with no rooms or back, just a facade. 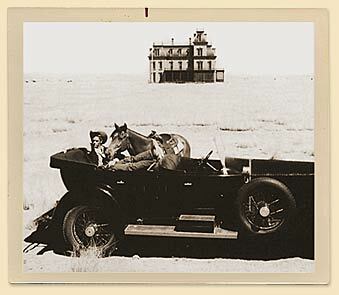 They constructed miniature oil derricks and placed them out on the prairie, and they took every available room in the Hotel Paisano and scooped up the available rent houses. 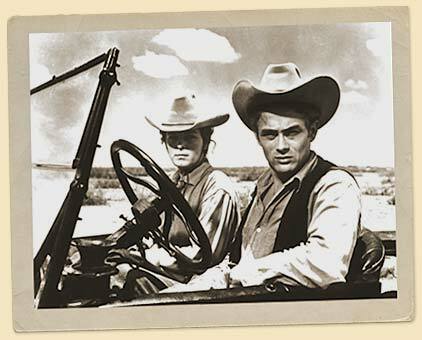 When they left, they had completed shooting the film adaptation of Edna Ferber's novel, Giant, a production that Dr. Don Graham has called "the archetypal Texas movie." It is a film that has forged the rest of the world's ideas of what Texas, and Texans, should be. In 1955, Marfa was a ranching town of about 3,600 people. Hollywood was still king, but a new medium called television was causing a stir, as more and more homes acquired this amazing invention. Even so, the old Hollywood way of making movies was firmly entrenched, and that meant that the studios wielded the power to transport an entire crew out to Marfa to add authenticity to a novel as it went to the screen. For hundreds of Marfans (or is it Marfites?) this was the chance to be in the movies. Extras were needed to be in the production, as were caterers, drivers and go-fers. For many of them, it was their day in the sun, their night in the spotlight as they worked closely with several of the film's stars. 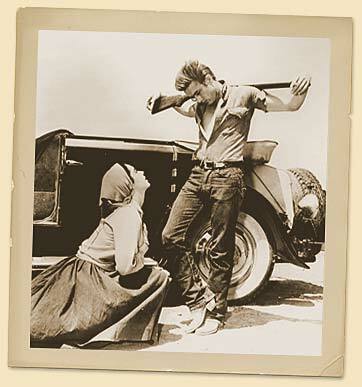 Rock Hudson and Elizabeth Taylor were already big-name stars who would attract an audience, but for excitement, producer/director George Stevens had cast the mercurial young actor, James Dean, to portray wildcatter Jett Rink. Bob Hinkle, a struggling young actor from Brownfield, Texas, answered the open call for cast members. Hinkle had been a professional rodeo cowboy before moving to Hollywood to try his hand at the acting game. He had earned a few small parts in some westerns, and would later appear on a few television shows, but he was thinking bigger things when he auditioned for the part of Jett Rink. "About two or three days later, I got a phone call to come to George Stevens' office on the Warner Bros. lot. My heart was pounding. I thought that I had gotten the part. "Mr. Stevens called me into his office and poured me a drink. Then he told me that he was putting me on the Warner Bros. payroll if I could teach Rock Hudson to talk the way that I do. "As I was walking back to my car, James Dean came up to me and asked what the meeting was about. I told him that I had been hired to teach Rock Hudson to talk like a Texan. Jimmy said that he would pay me himself if I would work with him. I told him that wasn't necessary; Warner Bros. was already paying me. I asked him when he wanted to start and he said, 'Right now.' "
For the next three months, Hinkle was Dean's constant companion, coaching him on his dialogue and dress. 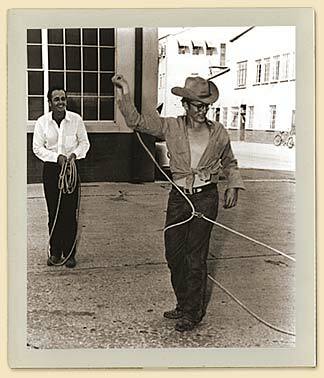 He taught Dean a few rope tricks and spent evenings with him shooting jackrabbits with a .22 rifle outside of Marfa. Years later, Hinkle would coach another actor, Paul Newman, in the movie Hud. In 1955, George Stevens was one of the most respected directors in Hollywood. He had persuaded Jack Warner (one of the Warner Brothers) to underwrite nearly $2.5 million of the movie's $5 million budget. Of course today that figure would barely get you one episode of Friends, but in 1955 it was the most expensive movie ever made. 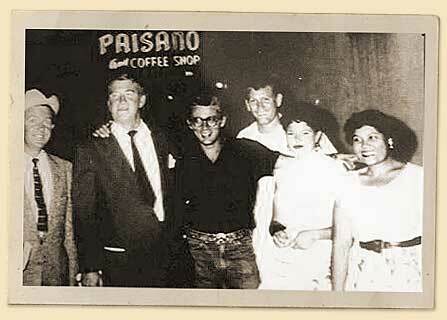 The crew of nearly 250 stayed in the Hotel Paisano in "downtown" Marfa, while stars such as James Dean, Elizabeth Taylor and Rock Hudson lived in homes that were rented for them in town. One of the cast members staying in the Hotel Paisano was a young actor named Dennis Hopper. "I was just 19 years old and appearing in my second motion picture," recalls Hopper. "George Stevens saw me in Rebel Without a Cause and cast me as Jordy, Rock and Liz's son. We all rode out on the train from Los Angeles to Marfa for the shoot." The storyline of Giant is about Texas families and change; Texas entering the modern era as it goes from a cattle-ranching economy to an oil and gas empire. It is also about the people caught up in the process of the transition and the rise of Hispanics, the earlier inhabitants of Texas. Rock Hudson and Elizabeth Taylor play Bick and Leslie Benedict, the wealthy cattle ranchers. 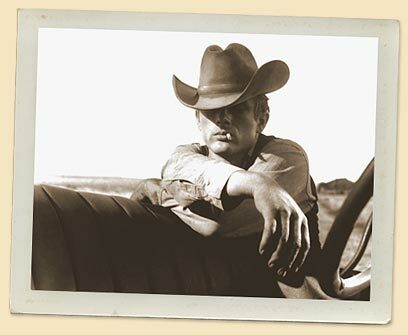 James Dean plays Jett Rink, their former ranch hand that strikes it rich as a wildcatter. Jett is the person who forces change on Bick and Leslie when he makes millions almost overnight. Jett is the "new money" while Bick and Leslie represent "old money." Almost all of the exterior shots, particularly the ones in front of the Reata ranch house, were filmed near Marfa. The interior scenes were shot on the Warner Bros. lot in Burbank. One Marfa resident who appeared on camera for a brief moment was Darlyne Freeman, who was at the time a junior at Marfa High School and a majorette in the marching Shorthorn Band. George Stevens hired the band for the scene in which Bob Dace (Earl Holliman) returns home from World War II. The scene called for Holliman to come down off the train as the band strikes up a welcoming tune for him and the returning GIs. "I was a majorette twirling two batons in that scene, "recalls Darlyne. "If you watch the movie, you can see Earl Holliman walk in front of me. I'm wearing my purple and white band uniform. "We spent the entire day shooting that scene. Mr. Stevens would have us do it over and over. They paid the band $350 for the days' work." Freeman remembers that there was a festive atmosphere about the city while the filming was taking place. "The Palace Theater here in town would show all of the star's films while they were here. We saw East of Eden with James Dean, and several of Rock Hudson's and Elizabeth Taylor's movies." For a 17-year-old girl and her girlfriends, the big attraction, though, was James Dean. "One night a bunch of girls and myself had a party and we invited James Dean. He was very approachable, not stuck up or moody like the papers said he would be. Well, we didn't tell him that he was going to be the only boy there! He came into the room and was he surprised. He was very polite, but acted shay and uncomfortable. He left after a short time," she said with a laugh. Another actor from Giant who Darlyne recalls fondly was Monte Hale, the glad-handing neighbor of the Benedicts. "Monte would get out his guitar and play in the evenings. He was my favorite out of the whole group. "It was a wonderful summer; lots of fun. There was a group of us girls who ran together all the time and we had the biggest time back then." For 19-year-old Clay Evans, the filming was a lot closer to home. 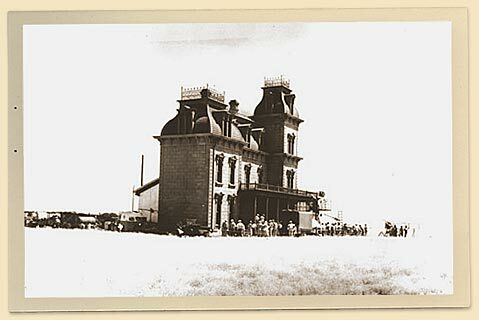 George Stevens had chosen the Evans Ranch as the site for the Reata, the huge mansion that rises up out of the plains. This was where most of the exterior shooting took place. The Reata was a false front, a facade, constructed of wood and plaster. There was no such ranch house in, or near Marfa, despite stories that to this day insist that a real house exists somewhere in Texas. There were also no interior scenes shot in another house in Marfa, but instead they were filmed in a sound stage on the Warner Bros. lot near Hollywood. "Warner Bros. approached daddy about using our ranch," recalls Clay. "They built the Reata right in front of our house. Used union labor." "I was an extra in the film," said Evans. "I got to be in some of the scenes working the cattle. If you look closely, you'll see me on a palomino horse. The movie helped the economy around here a lot, and we got to be around the stars. We had a bunkhouse out at the camp, and they (the movie stars) came and ate with us when we invited them. Rock Hudson, Elizabeth Taylor and James Dean-I thought they were all nice." 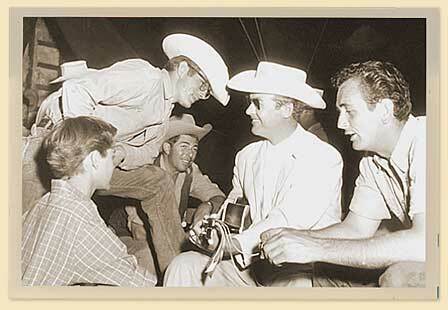 Because of the closeness of their age, Evans struck up an immediate friendship with James Dean. "Jimmy and I spent a lot of time together. When I knew him, he was just like every red-blooded American boy-he would drink a few beers and he liked the girls." After each day of filming, a plane would take off from the old Marfa air base and carry the day's shoot to California. There the film was processed and flown back the next morning. "They would show the rushes each day at the movie theater in Marfa," Clay recalls. "Anyone could come in and watch them." If there was one thing that stood out to Evans about the production, it was George Stevens' meticulous attention to detail, and its effect on the stars. "If they had asked me to do that over and over, I would have gotten upset, but Jimmy never did. I thought that he was very professional." Earl Holliman was another young actor trying to make a name for himself when he earned the part of Bob Dace, the boy who marries Liz and Rock's daughter, Judy (played by Fran Bennett). Holliman, who later gained fame as Angie Dickinson's costar in the TV series Police Woman, recalls that Stevens did burn miles and miles of film during the shoot. "Mr. Stevens had been a film editor before becoming a director, so he really enjoyed holing up in the editing room, cutting and piecing together the final version of a movie. "At that time, the average movie shot nearly 80,000 feet of film. George Stevens shot nearly 300,000 feet on Giant. He shot every scene from every possible angle. I remember thinking to myself as I was watching the rushes that I had never seen so much footage of cattle in my life." Stevens' zeal to shoot multiple takes and his epic movie making style seemed to know no boundaries. He spent three days filming the burial of Angel Obregon (Sal Mineo), always shooting at sunset. 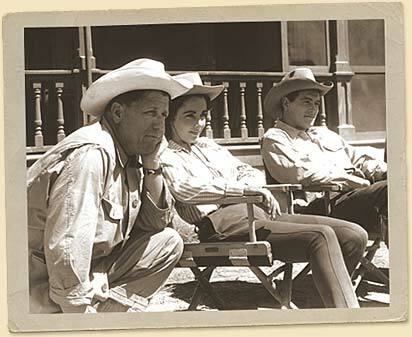 Nearly 4,100 cattle were used for the roundup scene early in the film, and a Christmas tree was cut in the Sequoia National Forest and flown into Hollywood for the Christmas day scene in the Benedict house. For more than two months Stevens and company took over the entire town. Each day they began at 5:00 am, and shut down at dark. After dinner in Hotel Paisano dining room, the stars would hang around while Monte Hale entertained them with songs on his guitar. In fact, there was almost a carnival-like atmosphere about the whole location shoot. Unlike most motion pictures, Giant was filmed on an open set, meaning that several hundred people could be watching as a scene was shot. "They kept some ropes up that spectators were supposed to be behind," recalls Darlyne Freeman, "But as soon as they took a break, the ropes would come down and everyone would rush around the stars and ask for their autographs." Not only was there a steady influx of gawkers and star seekers, but Warner Bros. kept the publicity machine cranking by flying in writers and reporters from every major daily newspaper. One of them was Elston Brooks, a reporter for the Fort Worth Star-Telegram. "I was there with two other reporters. One of them commandeered one of the Warner Bros. limos one night. We were in the back, enjoying their liquor, when the driver took us up to the house where Chill Wills, Rock Hudson and James Dean were staying. We sat in the living room, having a drink with Chill Wills, when the door opened and in came this character with a .22 rifle, a headlamp strapped onto his head, a big battery on his hip and smoke curling up around his temples from a cigarette dangling out of his mouth. It was James Dean. He had been out, walking around the desert, shooting jackrabbits at night." " 'These Actor's Studio kids are a weird bunch,' Chill Wills muttered to us." Chill Wills had the part of Uncle Bawley, a homespun, straight-ahead character who was always eager to open the liquor cabinet. During his stay in Marfa Bill Renfro drove him around the country. "I had to drive him down to Ojinaga, Mexico a few times," recalled Bill with a grin. If there was a place to unwind, it was Ojinaga. All of the actors made a trip there at one time or another. Earl Holliman recalls that it was their favorite spot for margaritas. 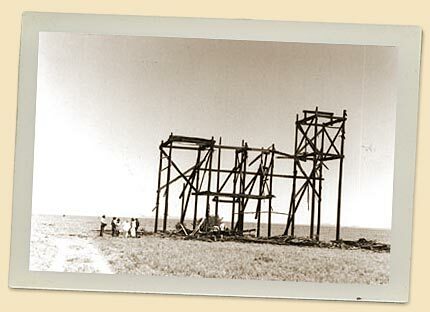 When the cast and crew finally pulled out of Marfa, they left the false front of the Reata standing on the Evans Ranch and a few of the miniature oil derricks that symbolized Jett's new-found wealth. For several years the Reata stood as mute testimony to that summer when stars fell on Marfa. When I was a five-year-old boy, my father drove my family and me out to see its remains. We still have some home movies of it, a three-story building, oddly out of place out on the plains of Marfa. Today the Reata is just a pile of rubble with a few of the treated timbers rising to the sky. It blew down in a windstorm years ago. The oil derricks lie on their side in the Evans horse pasture. 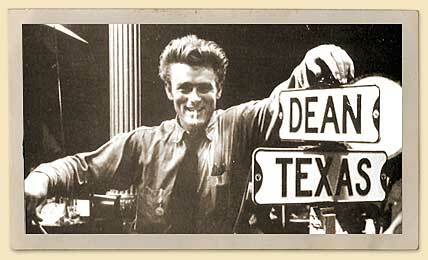 James Dean was killed in a car crash shortly after filming ended. He never saw the release of Giant. Ironically he filmed a safety commercial for the National Highway Committee just before his death. In an eerily prophetic statement, he looked at the camera and said, "Drive carefully. The life you save may be mine." Giant was his last film. His performance earned him a posthumous Academy Award nomination, but alas, the Oscar did not go to him that year. Rock Hudson succumbed to AIDS years later. Liz Taylor, Dennis Hopper, Earl Holliman, Carroll Baker and Jane Withers are all still living as of this writing. Hopper has enjoyed the most success, with starring roles in Hoosiers, Blue Velvet, Waterworld and Speed. Today the only center for Giant devotees traveling to Marfa is the Hotel Paisano, which was recently remodeled to its 1955 look and feel. The lobby display has several photographs of the stars, and you may watch a videotape of the film in a special screening room. The Palace Theater is across the street, but it ceased being a movie house long ago and is now a private residence for a local artist. The Clay Evans ranch is private property and is not open to the public. The Old Borunda Cafe where Liz Taylor ate enchiladas went out of business years ago. Outside of the Hotel Paisano, it's tough to find any traces of the stars from that special summer of 1955, Their spirit lives on in the upcoming digitally enhanced release of this revered Texas film from Warner Home Video. Others say that if you sit on your car hood just outside of Marfa at sundown, you can still here Jimmy Dean popping off a few rounds at a fleeing jackrabbit. On Thursday, September 30, at 730 pm The Texas Theater. will host a special screening of the documentary, Return to Giant. This will be the "director's cut" featuring several deleted scenes from the version currently available on the Warner Bros. DVD of Giant. Tickets are $8 apiece. Filmmaker Kirby Warnock will introduce the film and hold a Q&A with the audience afterwards. This screening is presented by The Texas Theater and Trans-Pecos Productions.